Ana Claire...goes by Ana Claire. She is utterly and completely scrumptious. The best accessory of my home and life. AC joined us a little early (her due date was today!) She joined us on Thursday, December 13th, at 11:24 pm weighing a darling 7lbs 5oz and measuring 19". Life is different and we are just humming along, loving every second of our new family. I was so eager to share the news with you!! This picture is from this morning...hot off the presses. Hope you've been well and gearing up for Christmas if you celebrate. We are so excited that we'll get to celebrate Ana Claire's first Christmas together. Aww. Congratulations!! She is gorgeous! This is so exciting. The world will never look the same, again. The best part of my life began the day I became a mom. Enjoy your daughter, she is beautiful and perfect. Congratulations! Beautiful name for a beautiful baby! Congratulations on your beautiful new addition! She's beautiful! Congratulations - she is lovely. A perfect Christmas present. She is simply perfect. Congratulations and merry Christmas!! So happy for y'all!!! Beckett's birthday is 12/13. Christmas birthdays are fun!! Yippeeeee!!! 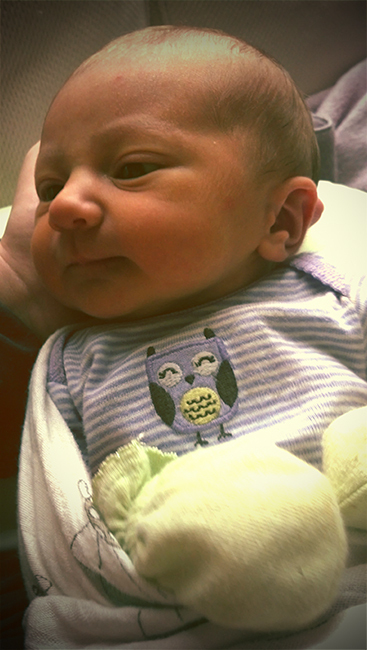 A perfect little niece! We can't wait to see her in person. Congratulations! She is so cute. You probably just want to eat her up. What a perfect X-mas gift. So precious. You know how people always say, "They grow up so fast." Well, they say it for a reason. Treasure every minute! Congratulations! She is completely gorgeous, just like her mama!!! That is a lovely baby girl! Congratulations from all the girls in our workshop! Congratulations! She is beautiful! I am so thrilled for you. Congratulations! She's perfect. Best wishes for a wonderful first Christmas together! Welcome to the world, Ana Claire. Your name is as beautiful as you are. Congratulations, Mom and Dad!!! Yay for a happy, healthy baby! And long live double names! Beautiful, beautiful little girl, congratulations, a wonderful Christmas blessing. Best Wishes to you and your family! She is precious. Congratulations!! She is beautiful and I'm sure you are just loving soaking up every precious moment. I am right behind you and starting to feel ready to go. Full term next week - yikes! Congratulations! What an absolutely adorable baby and the best Christmas gift ever! She is beautiful! So happy for you! Enjoy this very special time! Now that's the PERFECT Christmas present - she's gorgeous!!! She's beautiful! And you chose a lovely name. What a special Christmas this will be for our family! Congratulations! Have a wonderful holiday with the best gift EVER. congratulations!! She is totally precious. What a perfect holiday "gift!" Happy New Year. Congratulations! She is beautiful. Enjoy your Christmas blessing. She is beautiful! Love her name! Your life is be forever full now!! !Congrats!